Tarbes will not forget Grace Daley of Montpellier in a hurry: she alone scored 23 points in the first half and finished the match with 29 points and she also hit 5-of-6 from beyond the arc as Montpellier won away from home (87-71).At the start of the match Tarbes looked comfortable and kept their opponents in check (8-8). Then after Grace Daley fired her team up as they hit their hosts 22-5 to finish the first period in strong position (30-13). Tarbes left with no choice going on the offensive but unfortunately left themselves open for Montepellier’s fast breaks and as a result did not close the gap at the interval (59-41). After the break they did reduce the deficit to 13 points with Clémence Beikes and Kristen Mann working well offensively. Daley came back to the rescue for Monpellier and the 20-point lead was restored going into the final period. Beikes went for five fouls in the final period and with her departure, Tarbes’ chance of coming back disappeared. For Montpellier Sandra Dijon finished with 15 points and was joined in double digits by Chris Jouandon (12), Aurélie Bonnan (12) and Elodie Bertal (11). For Tarbes Gisela Vega finished with 20 points, Mann (17) , Liz Moeggenberg (15) and Beikes (11). Mondeville beat Mourenx (86-73) on the road with in particularly good form Caroline Aubert (20 points, 6 assists), 4-of-7 from 3-point. Mondeville did not waste much time in imposing their authority in this match by taking an early lead in the first period (14-7). Mourenx have a habit of playing in bursts and in two separated occasions came to within 1 point of their guests. However on each occasion Paoline Salagnac (19 points) was on hand to restore the advantage back to Mondeville. Naré Diawara and Leane Williams joined Aubert and Salagnac on double digits with 12 points each. Kaayla Chones finished with a game high of 22 points in a losing cause. Ana Lelas was the only other player from Mourenx to finish in double digits with 12 points. In the other games on Saturday night USVO beat Arras (70-57) but once again had to work hard. Nicole Ohlde finished with a game high 22 points for the hosts, Laurie Koehn with 16 points and 3-of-4 from the land of many and Francesca Zara with 10 points. 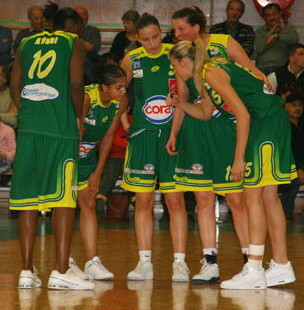 Sheana Mosh scored 15 points for Arras. The big match of the weekend was over by half time when Bourges hit Villeneuve 22-6 in the second period. Bourges went on to win (67-42) with Belinda Snell leading the scoring with 14 points and Nora Bujdoso the only other player to reach double digits with 12 points. Challes-les-Eaux came from behind to beat Reims (65-55). In the LFB round 3 game of Sunday nothing was going right for Aix-en-Provence, yet again, as they lost at home (64-44) to St Amand. For St Amand Tamara Moore and Tiffany Stansbury combined 31 points and 19 rebounds and found support from Olena Ogorondnikova with 11 points as they won comfortably. Kelly Santos scored 15 points for the home side. In the last game of the weekend Clermont-Ferrand put away Calais (84-69).